Remember Nutellotti? The super easy three-ingredient Nutella-based biscuits? When I first made them I had been inspired by the recipe popping up in my newsfeed and triggering my curiosity. 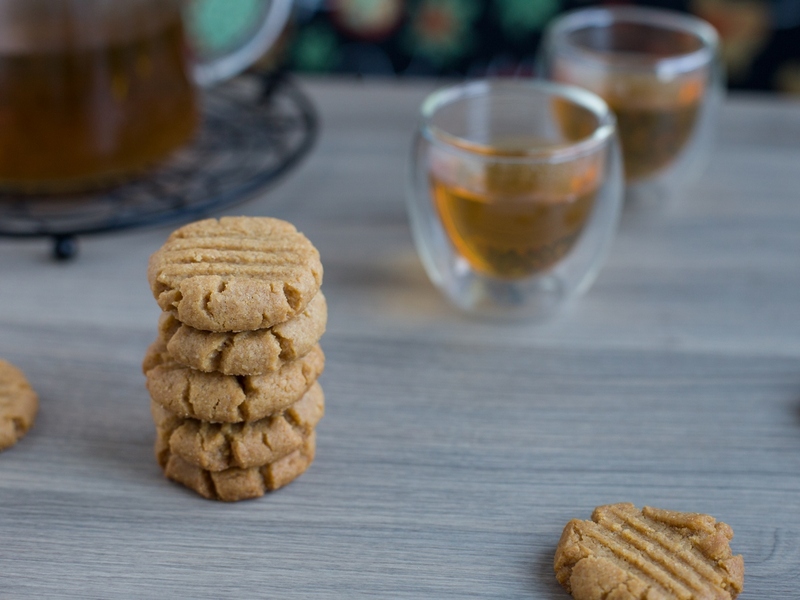 The same has happened again, recently I stumbled upon another three-ingredient cookie recipe that features a spread – peanut butter this time – and I was hooked. I had to try it. While Nutellotti have Nutella as the main provider of sugar and fat, and you only need to add flour and one egg, in the case of peanut butter cookies you still have to add one egg, of course, but sugar instead of flour. Clearly, peanut butter isn’t sweet so something to make them sweet needs to be added. 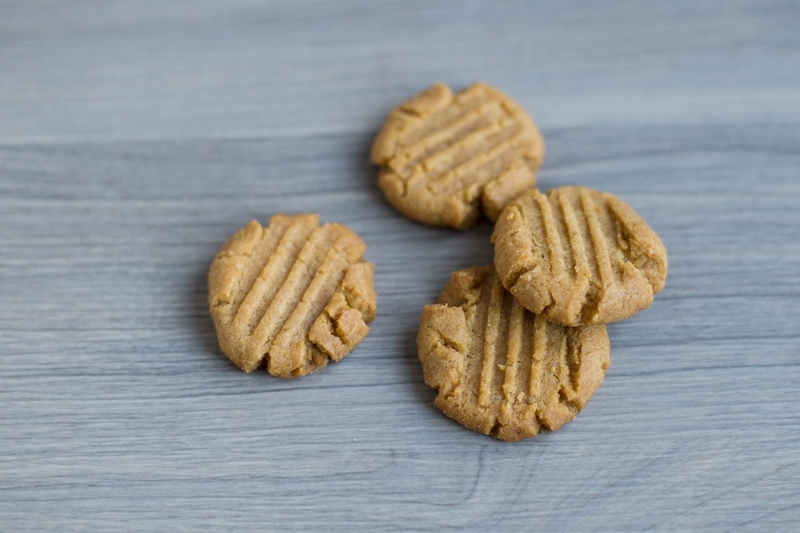 But that’s it – peanut butter cookies feature no flour, thus being friendly for people with a gluten allergy (but life-threatening to those with peanut allergy, so I won’t be able to take those to work next week). Preheat the oven to 175°C. In a medium bowl combine peanut butter, sugar and egg. Most recipes I found called for white sugar, but I decided to use cane sugar instead. I like it better (and I had just bought a whole new package). Mix the ingredients for a couple of minutes with a hand mixer until a dough forms. Line a baking tray with parchment paper. Divide the dough into small balls and lay them on the tray. I am very serious about making all cookies the same size, so I weighed mine and made them all 15 g. Gently flatten them with a fork, this will also create a simple nice design on top. The cookies will not flatten further or melt as they bake, so they can be lined up pretty close to one another on the tray. Bake at 175°C for 10 minutes. Just like when I made Nutellotti, I experienced the same texture problem: my biscuits cracked when flattened before baking. I am guessing it is again a matter of size of the egg. With Nutellotti I was able to fix the problem adjusting the quantity of the flour, but this time I just gave up and accepted the shape they took. I think that a slightly more rustic feel could also look good. In the end, I’m not always aiming at perfectly crafted baked goods. A touch of simplicity sometimes is just what you want from home-made food. 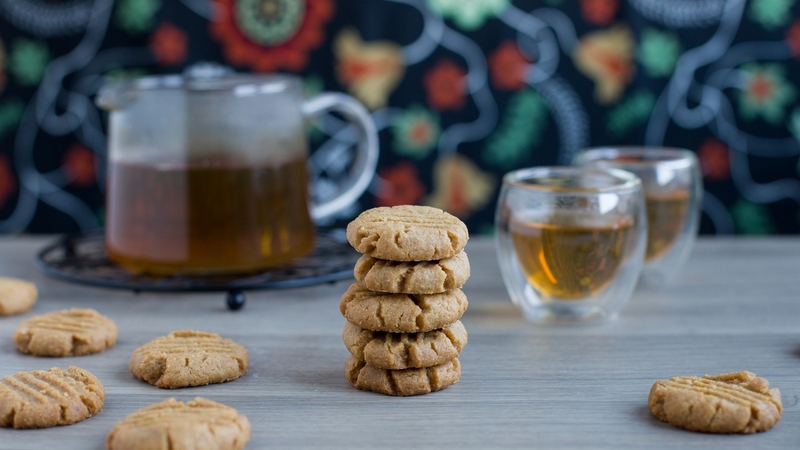 This flour-free cookie recipe might have originated with this one found on every jar of Kraft peanut butter in Canada: http://www.kraftcanada.com/recipes/super-easy-peanut-butter-treats-86637… it caused quite a scandal when they first publicized it due to the lack of flour. Personally, I prefer my PB cookies with flour, but lots of people like this one. Also, as far as I am concerned (and I think most other North Americans would agree) PB cookies are *supposed* to have the cracked edges, so don’t worry about those! I hope you have a wonderful Christmas, wherever you are spending it. On the website you linked they suggest to use this dough as pie crust. What a wonderful idea! I’m spending Christmas in Sweden, I have a seasonal job and work on Christmas day so couldn’t make any plans. But it’s good to be back at work, after a few months only relying on a small online part-time job. Hope you’re having a great and relaxing Christmas time!